BBC SPORT | Rugby Union | Lions in NZ | Legend or loser? 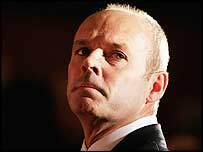 Sir Clive Woodward was knighted after winning the World Cup with England but his reputation is in tatters following his stewardship of the Lions tour of New Zealand. But as he leaves rugby union, how will history judge Woodward's coaching career? 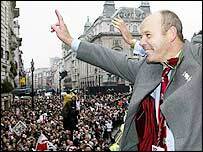 When he took charge of England in 1997 they were a good team, but not world beaters. A gifted player whose high-risk approach to the game was 15 years ahead of its time, Woodward had no qualms taking on the entire culture surrounding top-level English rugby to create a winning mentality that brought the ultimate prize. He ruthlessly blasted away the cobwebs of the amateur era, spending millions of pounds to create the infrastructure needed to run a professional international side. Whether it was the changing room decoration, the diet, the cut of the kit, the visual awareness coach, laptops for the players, commando-style training, or time-keeping, nothing was left untouched by Woodward and his team. It paid off as the 2003 World Cup approached - England rising to the top of the rankings with an unprecedented run of 10 consecutive victories against the three southern hemisphere giants - New Zealand, Australia and South Africa. Had Jonny Wilkinson's last-minute drop goal not gone between the posts in Sydney, it is possible - given the three blown Grand Slams in 2000-2002 - that Woodward's track record with England may have been judged very differently. But the trophy put the unquestionable golden seal of approval on his approach; painstaking organisation, powerful self-belief, a slick game-plan and a set of talented key players signed up to tactics that suited them. In Australia the plan came together in England's controlled last-minute drive that ended in that coolly-slotted drop goal. In New Zealand, history will say the plan was flawed from the outset. And Woodward - whether through egotism, as his harshest critics claim, or ignorance born from focusing too closely on England - was unable to respond. For what worked in the long-term, controlled environment with the national side, was not so successful when applied to the short-term nature of the Lions. With a squad drawn from four national teams and together for only a few weeks, it proved impossible for Woodward to impose his vision in the same way as he had with England. He hoped, by packing the first-Test side with the England players who won the World Cup, to maintain continuity and power. So he went with a pre-ordained team for the opening Test that relied on a defensive plan since branded by some, including opposite number Graham Henry, as two years out of date. It also made a mockery of pledges to pick the best 15 on form, not to mention the whole Lions touring ethos of players earning their right to a Test shirt. As BBC rugby union correspondent Ian Robertson says: "Woodward has copped an enormous amount of flak but if you keep it very simple he got one thing wrong. "He must have picked his first Test team in May before they even left for New Zealand. 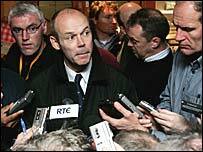 He went for reputation rather than current form and included four England players, heroes in 2003, who 20 months later were out of form and did not deserve to be selected." "Having spent four weeks preparing the wrong Test team, it was very difficult to recover." The flawed game-plan might have been discarded during the four week lead-in to the first Test had Woodward been put right by a few choice words from senior players. For instance his England skipper Martin Johnson reportedly ignored a third of his coach's wackier ideas. But many of the senior Lions were England players of the same mould and belief. In the end the personnel on whom his plan depended - the likes of Neil Back, Jason Robinson and Jonny Wilkinson - were exposed as the Lions were thrashed by a rampant All Blacks side. Sporting 11 changes to the line-up, the second Test Lions still managed to show Woodward briefly what might have been with Gareth Thomas' opening try. But their unfamiliarity with each other told as the All Blacks racked up a record score. Building a big back-up team had worked well in the long-term, settled environment with England, but the huge support staff he took on the Lions tour was bloated and unwieldy. His boast that this would be the "best-prepared Lions team in history" came back to haunt him just as his knowing plea to "judge me on the World Cup" had done in 1999. Small details which would have been hailed as masterstrokes in the England World Cup win backfired in New Zealand - wristbands issued to players seemed crass, the refusal to call the opposition the All Blacks seemed forced and disrespectful, the Power of Four song hollow and disliked by fans. He failed to appreciate the unique nature of the Lions, alienating many fans from the start. This was reflected in his choice of former Labour spin doctor Alistair Campbell as media officer, which antagonised their fans, the media and the All Blacks alike. There can be no doubting Woodward's strengths - the long-term vision and planning ability to create a winning environment for the players. But the Lions showed that when he is put in a situation that does not suit his way of working he may be too inflexible to change. Rugby historians are likely to remember him as the man who shook up English rugby and brought it the World Cup, rather than the man who led the Lions to disaster. But if he now joins Southampton Football Club as technical director as expected, his success or failure there may depend on his ability to learn that lesson.